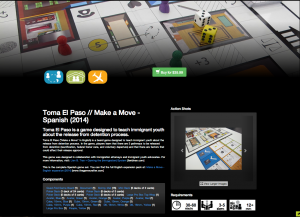 For those who have been following my Gaming the Immigration System project and the status of Make a Move (Toma El Paso in Spanish), I’m happy to announce that the game has been translated into Spanish and is now available for purchase! I’ve been working with local immigration experts here in Miami (thank you Americans for Immigrant Justice and University of Miami’s ICAN network) to confirm the content and Spanish language translation. Since the majority of undocumented unaccompanied immigrant minors (UUIMs) are Spanish speaking, I’ve published the full version of the game in Spanish with an English expansion (you can use the English chance cards and release mats with children who prefer communicating in English). If you will only be playing with Spanish speakers, please order the Toma El Paso version. If you will be playing with both Spanish and English players, then also add the English expansion to your order.